The Chrysler V8 5.7L HEMI engine has appeared in two versions, the 2003-2008 pre-VVT version, followed by the 2009+ 5.7L VVT version which replaced it. 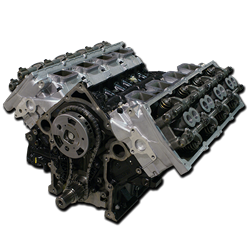 Using either of those versions, the Arrington Forged and Stroker long blocks replace all of the moving parts with forged, high-performance upgrades. The result is suitable for high-boost applications (turbocharged or supercharged) or higher-power, higher-displacement custom setups.